SET G IS ONE OF OUR MOST POPULAR SETS SINCE WE CAME OUT WITH IT. 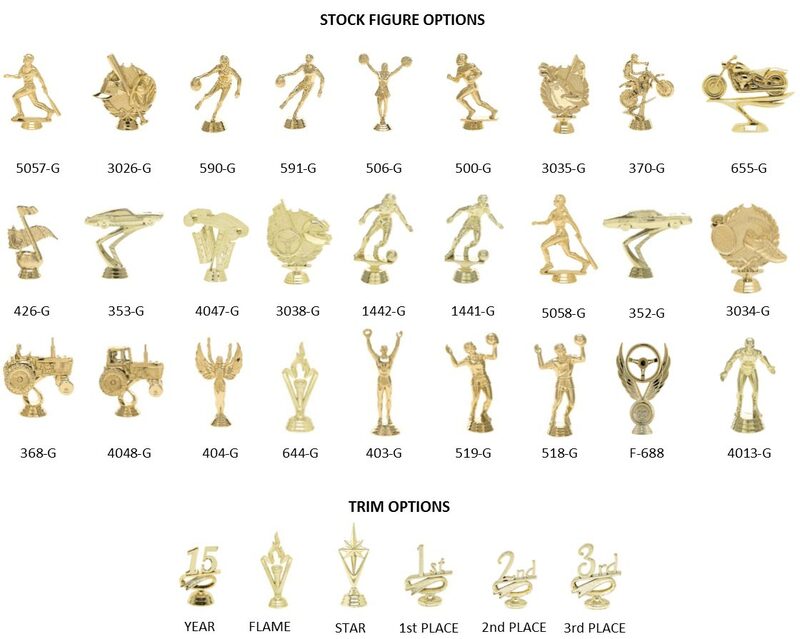 THIS SET GIVES YOU ALL THE LOOKS OF A REALLY EXPENSIVE SET OF TROPHIES, BUT WITHOUT THE PRICE TAG. YOU WON’T FIND A BETTER SET OF TROPHIES AT THIS PRICE POINT FROM ANYWHERE ELSE. THIS SET IS MADE UP OF A 3 COLUMN SQUATTY TROPHY STANDING AT 18 INCHES TALL FOR 1st PLACE SIZE. THE 2nd PLACE SIZE TROPHY IS A 2 COLUMN TROPHY STANDING AT 17 INCHES. THE 3rd PLACE TROPHY IS A SINGLE COLUMN TROPHY WITH A BLOCK ON TOP THE COLUMN, THIS STANDS 13 INCHES TALL. (ALL MEASURMENTS ARE BASED ON A FIGURE HEIGHT OF 5 INCHES). THIS TROPHY SET ALSO COMES WITH FREE ENGRAVING. Click the button below to add the Set G to your wish list.